Aculon® manufactures materials for improved adhesion between substrates and coatings. Three of our most popular adhesive products are primers. These primers, as well as their active ingredients, are available by contacting us. Larger quantities or custom formulations are available upon request. Aculon® also offers Laboratory Services to assist with implementing this novel technology into your process or product. Sometimes problematic adhesion issues not only require the appropriate Aculon® Primer or Adhesion Promoter, but they also require surface analysis of the existing surface as well as the proper surface preparation or cleaning solution before the priming/coating step(s). Aculon® Adhesion Promotion Surface Treatments or Primers improve the adhesion characteristics of metals (and other oxo or hydroxyl functional substrates) through the use of self assembled monolayers of phosphonates (SAMPs). The most common use of SAMP containing Adhesion Primers is to improve the adhesion of metals to polymeric coatings. Aculon® Primers contain reactive groups that will strongly bond with coatings containing functional groups such as epoxies, polyurethanes, acrylates, and oxide particles. Aculon® Primers are easy to apply and can solve problematic adhesion issues. 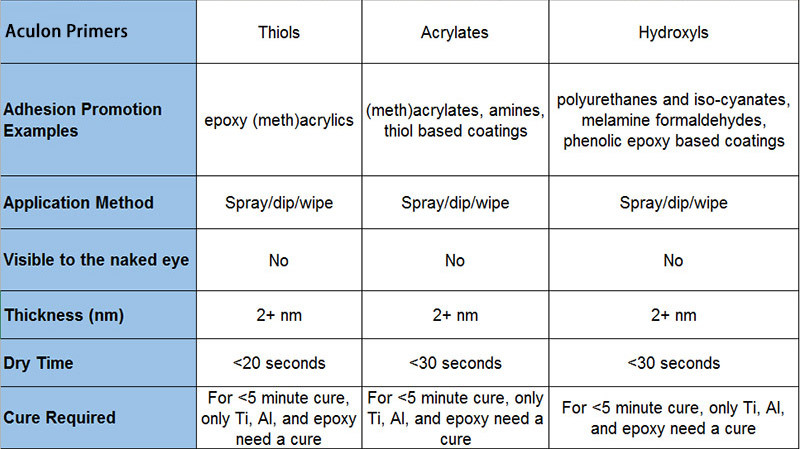 Also, their actives can be blended into existing formulations for increased surface adhesion of coatings and adhesives. Do you have large volume needs or have a specialized application requiring vendor support? If our OTS offerings don’t suit your needs please reach out so that we can discuss a custom implementation of our technology for your process or application. We can optimize a process for you then either treat your parts at our facility or provide you with the materials and procedures to treat on your own! Click the button below to submit your information and an applications expert will reach out to see how we can assist. Please note: At this time we are a B2B company and do not support consumer inquiries. Apply Aculon® Adhesion Promotion Surface Treatment via dip bath for 30 seconds to fully treat parts with a uniform treatment ensuring even coverage over entire part. Aculon® Primers comes in convenient 1L or 4L quantities for dipping applications. Apply Aculon® Adhesion Promotion Surface Treatment via a simple wiping process. Using a clean cloth, wipe the treatment across the surface in a buffing motion. Spray the solution onto the substrate using double passes. Post-application curing is recommended for best performance. For use as a formulary additive. The recommended loading ranging between 0.1%-5% by weight depending on the coating or adhesive. For robust bonding and optimum performance a properly cleaned and prepared surface is imperative when using Aculon® Adhesion Promotion Surface Treatments. Cleaning Methods can be summarized into Good, Better, & Best Options. The cleaning options below assume that the part being treated has first been sufficiently degreased and cleaned of all visual contaminants. 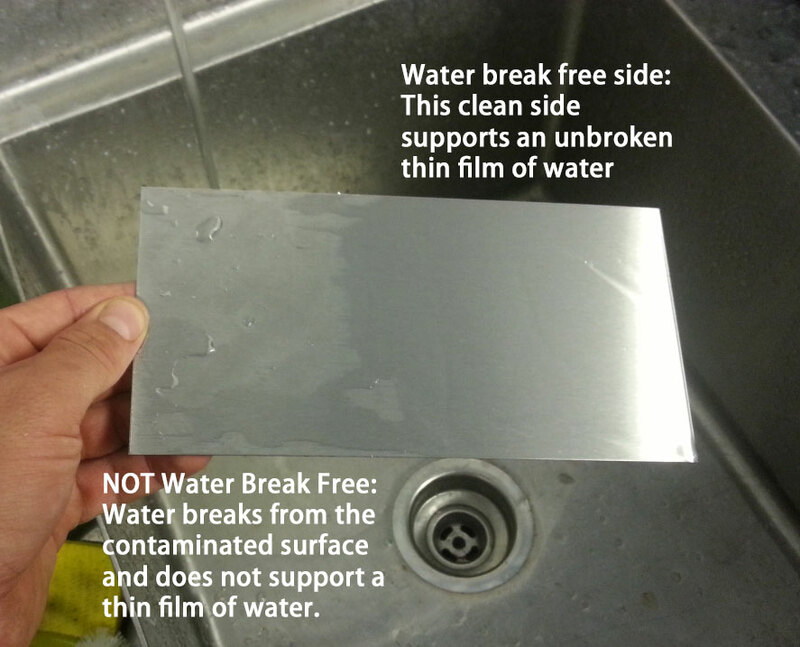 Optimal bonding is typically achieved when a water break free surface is achieved (usually better & best cleaning options). Depending on the deposition technique, at least one monomolecular layer is deposited, which for most Aculon® Primers is approximately 2-4 nanometers (nm) in thickness. How do you know it is only 2-4 nm thick? Via QCM, AFM, and XRD we have quantified monolayer thicknesses. Also, the actives generally react with the surface but not themselves, so theoretically the treatments are limited to the chemistries monomolecular chain lengths. No, it is 100% optically clear. Minus the change in performance your properly treated part will look exactly the same. Is it possible to over apply the primer? Yes, if excess primer is not soluble in the applied coating, excess material can interfere with adhesion. In this case, rinsing the Primer after application is necessary to improve adhesion. IPA is an effective solvent to remove excess primer.